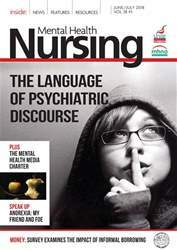 Iam a third-year student about to embark on a career as a mental health nurse. For years, I struggled with horrific violent and sexual thoughts about harming others. I would hide sharp objects out of sight to protect people close to me. I would plead with my brain to stop tormenting me. I genuinely thought there was a devastating menace ready to explode out of me at any moment.